Bagatelle Concrete is a pinball machine turned musical instrument. It is played for making music rather than achieving a high score. Consequently, the score board was replaced with customized speakers. The more successfully the player interacts with the machine, the more intense the accompanying soundtrack gets. The piece maintains the roughness of the electromechanical original game, mixing physical sounds happening on the playing field with manipulations of their recordings. All you hear originates in your style of play. Listen here. The term “concrète” references musique concrète. The other half of the name – “bagatelle” – points to the history of pinball games. 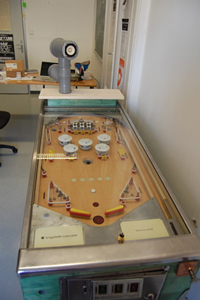 Bagatelle was an ancestor of modern pinball created in 1770 for King Louis XVI and Queen Marie Antoinette of France. The exhibition of “CODED CULTURES – Exploring Creative Emergences” is on until Sunday, May 31. It is exhibiting work situated on the intersection of disciplines.